Remember every phase of school fondly with this endearing school years frame. 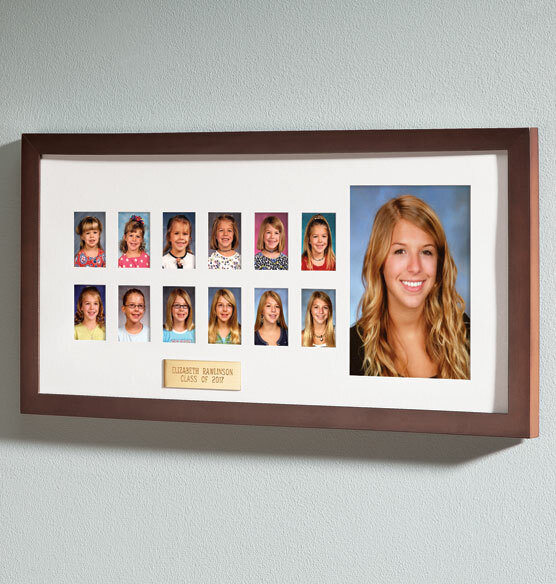 Crafted of rich walnut and glass, this school year picture frame features 12 small and one large opening for displaying a collection of school pictures. Our fine quality through the years school picture frames make wonderful graduation gifts for graduating seniors or proud parents. Personalize the plaque with up to 2 lines, 30 characters per line. The color of the frame was what I thought it would be put the cutouts for the pictures are way too small. Definitely won't hold the wallet-sized pictures without cutting off part of my son's head. Also, the "plaque" with his name on it is cheap and not what I expected. Not worth it at all. I have 4 children and I have kept a frame of all their childhood school pictures. Have same one for my daughter who graduated and love having a way to display the photos from Kindergarten to graduation. I have three of these frames for my grandchildren's school pictures and enjoy looking at them.. I am going to have a new granddaughter and need a frame for her pictures so it will match the others. Very nice product. on photos for all of them. I have enjoyed looking at my childrens progression throughout the years. My daughter has one now my son needs one as well. I have one for my older daughter and it's good quality and nice engraving. I ordered the same item over 10 years ago. I love them! And they still look great! I have one in black I ordered a few years back. Great item!!! Good quality! it's the only brown wood frame that I could find that had wallet size photo openings. All the rest i found on line have black frames. I bought these for my family when my kids were babies. Now with my kids in high school, one of whom is a senior, I love seeing all of the school pictures together. It resembles the same frame that my other children have that I got from another place years ago, who no longer sells them. Plus I was looking for one that you could personalize. This a present for my nice. Thank you!!! I filled my sons school years frame but for my daughter the frame I purchased from Exposures (years ago!!) has smaller boxes and school pictures don’t come that small anymore so I have to buy her another frame to compensate for the larger pictures. I had one made for my oldest daughter many years ago & now needed one for my youngest daughter. I've been looking for a nice looking school years display frame and I like the style and plaque is a nice touch too. Wish I had done it for my children. Doing it now for my grandchildren. Replacing frame that fell off the wall and was damaged. Good price and I like it as personalized. My kiddos are in 2nd and 4th grades and I want to capture their changes as they grow through the years! Great graduation from Kindergarten gifts! Do you still have the school years frame in black? BEST ANSWER: Thank you for your question. It only comes in the oak color frame. We hope this information will be of help to you. I am looking for a white frame and archival matte for 11 2.5x3.5 wallet photos plus 1 5x7 senior photo -- do you have anything like that? This one the photo openings are too small, and I don't care for the walnut frame. BEST ANSWER: Thank you for your question. Unfortunately no, we do not have frames to fit a 2.5x3.5 photo. Please do a search on our website for 5x7 frames for the senior photo. We hope this information will be of help to you. What size are the small pictures and the large one? Is wAlnut the only frame it comes in? BEST ANSWER: Thank you for your question. It holds 1 – 4 1/2" x 6 1/2" photo and 12 – 1 1/2" x 2” photos. We hope this information will be of help to you. Do you still carry the large school years frame? BEST ANSWER: Thank you for your question. No, we no longer carry the large frame. We hope this information will be of help to you. Can I have it without the plaque? BEST ANSWER: Thank you for your question. You need not personalize the plaque, it comes with it no matter what. I purchased a similar one from Exposures years ago without there personalization and large photo in the middle. Any chance that is still available? It was recently broken but I have matching for my other children. BEST ANSWER: Thank you for your question. Unfortunately we do not have a School frame that fits your description. We apologize for any inconvenience.